Facebook’s news feed is organized by complex algorithms, but now the social media giant will tell users why that specific post popped up in the feed. On Sunday, March 31, Facebook shared an upcoming tool, ‘Why Am I Seeing This,’ that’s designed to demystify the reasons certain posts appear in your feed over others. 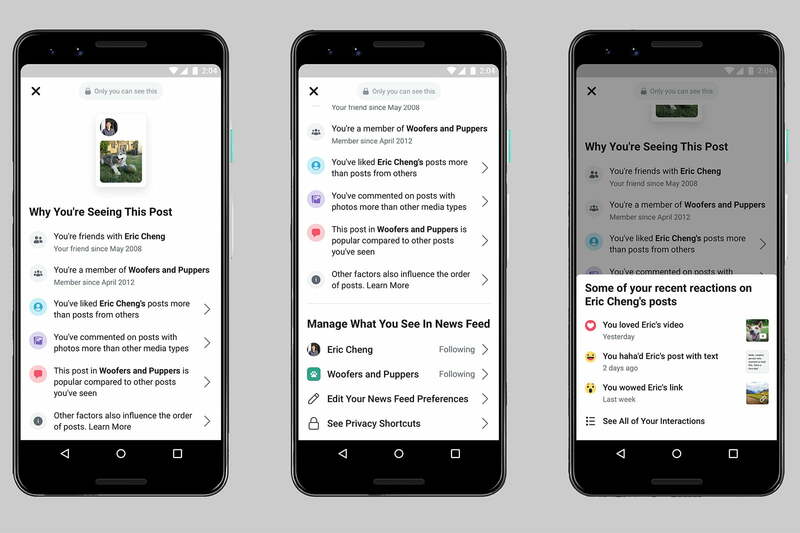 While the tool is based on the similar option, ‘Why Am I seeing This Ad?,’ Facebook says it’s the first time the company has built a news feed transparency tool directly into the app itself. To use the upcoming tool, users can tap on the “…” menu and choose the “Why am I Seeing This?” option. The pop-up page that follows will list why the post appeared in your feed, as well as reasons why the post appeared before others. For example, Facebook may tell you that you’re seeing the post because you are friends with the user or part of a Group. Facebook will also list if you’re seeing the post because you’ve interacted with that user’s posts more than others, if you tend to react more often to a certain media type like photos or videos, or if the post is simply more popular than others. The tool also includes shortcuts to update newsfeed preferences, including options to unfollow the user or to see their posts first, and access to the full list of options inside the news feed preferences. The update doesn’t change the existing algorithms but helps users see what goes into determining what pops up in the feed. Facebook will also update the ad tool that the new option is based on, ‘Why am I Seeing This Ad?’ In addition to existing options like ad targeting based on demographics, Facebook will now tell you if a company obtained your information outside of Facebook. One of Facebook’s ad tools allows businesses to upload hashed customer information, such as an email subscriber list, to advertise to those same people on the social network. Facebook can use the email or phone numbers the business provides to target those ads if the same information is also connected to your Facebook account. The tool will now tell users that are included on that hashed list, which prevents the company from seeing personal data. Facebook users will start seeing the changes beginning today. The company says it will continue to look for ways to improve the new transparency tool.